Standing on a crowded tram on a dark December morning, watching the rain beat against the window while watching the resigned faces of my fellow commuters shuffling with their wet umbrellas, I reflected on how most of our lives are taken up by an acceptance of routine and the mundane. Time can anaesthetize us to that routine until it seems normal. But then a moment of clarity flashes and the cloak is lifted to reveal the rapid passage of time and ones life. It was one such bleak winter morning that the thought of spending the summer in warmer climes began to germinate. The south of Spain is only a two-hour flight from Dublin and so that was going to be the base for my summer adventure. It’s a funny thing but familiarity often breeds contempt, and after a month trying to hike in southern Spain, I was missing the variety of the Irish weather. A cloud floating through the sky is needed to appreciate the clear blue sky yonder. So around the middle of June, I found myself in the valley of Benasque at the foot of the Aneto Maladeta in the Pyrenees. This area is a contrast from the south in that instead of a dry arid landscape, there is a rich variety of lush green flora. It has the intense greenness of Ireland, but with a warmer climate. Benasque is a four drive on the A2/A22 highway from Barcelona and is situated in the west of the Maladeta Massif. This area lies in the Posets-Maladeta nature reserve, which is an area of some 33,000 hectares. The Pico de Aneto peak is within the Aneto-Maladeta Massif. This massif contains the largest glaciers of the Pyrenees with around 230 ha of ice. Climbing the Pico de Aneto entails crossing two glaciers – the Glaciar de la Maladeta and the Glaciar de Aneto. It is now the morning of the eve of the Summer solstice and I am sitting at an outdoor eatery enjoying a café americano in the shadow of the Aneto. It seems like providence that I am alone at the base of the Aneto and tomorrow is the longest day of the year. Pondering my situation, I make the decision that I want to be standing on the top of the highest mountain in the Pyrenees tomorrow, even if that means soloing it. The little village of Benasque has many outdoor shops and in one of them I find a map and small multi-lingual guidebook to the Aneto Maladeta. Over another café americano, I study the map and read the one page description of the Aneto. The description is brief but adequate, but it mentions the need for a rope for cracks in the glacier and the final stretch to the summit, the Paso de Mahoma. 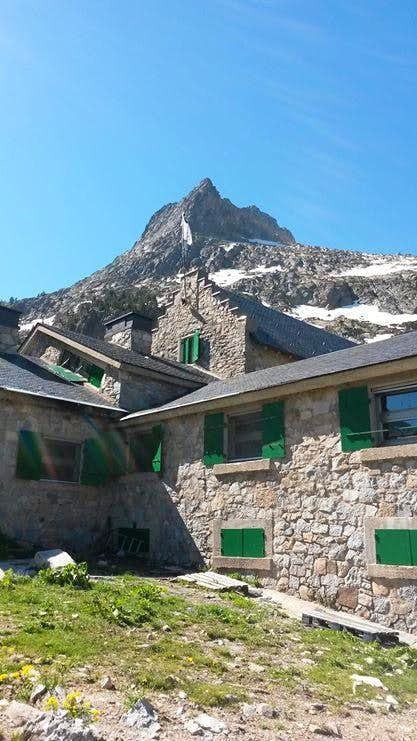 The map shows the that nearest car park to the refugio is at La Besurta, which stands at a height of 1895 m, and is situated at geographical coordinates: N42.67884 E0.64982. Please note that geographical coordinates refer to lines of latitude and longitude. Now, before I continue, I would like to briefly mention the grid system used on the map. This map, like most modern maps in Spain use a grid system called UTM (Universal Transverse Mercator). This is similar to other map grid systems, like the National grid. 31T 30744E 472782N (accurate to 10 m). The first number is the zone, which is then followed by an easting and northing reference. UTM coordinates are more useful when navigation with a map and compass, so I shall use them in my descriptions. At the end of this article, I provide a conversion table between the UTM and geographical coordinates that I have used. The guidebook mentioned a rope for prevention of fallen through cracks in the ice and the last exposed section. As I’m soloing, a rope will not be an option, so I do some further research and learn that the cracks in the glacier don’t become a problem until September. 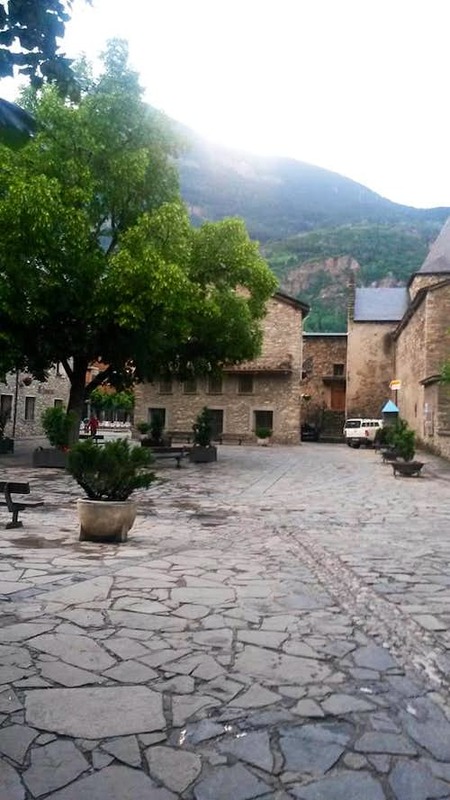 Armed with my map and guidebook, I leave the village of Benasque and drive northwest for about half an hour in the direction of the mountain hut, the Refugio de la Renclusa. I will spend the night there before my summit attempt tomorrow. It should be noted that access to the La Besurta car park closes for the summer. I was fortunate in that it wasn’t closing for another week. When the car park closes, it is necessary to park at another small car park just before the Hospital de Benasque and then hike for an extra hour. From La Besurta car park, it is about a 40-minute hike up the Refugio de la Renclusa, which stands at 2,127 meters. The geographical coordinates of the hut are: N42.67884 E0.64982. The refugio was very clean, comfortable and quiet, with a well-equipped bar. That night there were about 30 people staying at the refugio, most with the intention of climbing the Aneto the following day. I got speaking to a French couple that had climbed it many times before. 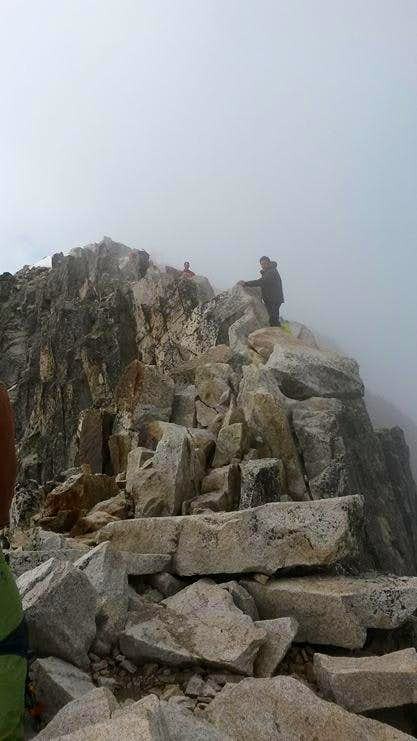 The man had climbed it all the way to the top, but his wife never reached the summit, choosing to stop 40 metres shorter, rather than cross the very exposed Paso de Mahoma. The man explained that it was easy to cross, but it was just psychological fear. I detected a slight annoyance from the man at his wife for not crossing it, but she remained adamant that she wouldn’t do it. I conversed with a few more people and the subject of the Paso de Mahoma came up again. At that point I resolved to get as far as the Paso de Mahoma and either cross it or turn back, but in any case not to think about it anymore. That night one could sense the heightened anticipation in the room, with people listening to the weather forecasts and looking out to the sky. It is now 4:45 am. I get up; quickly get dressed; and have a communal breakfast. The refugio serves breakfast from 5:00 am to 8:00 am. By 5:35 am, I am leaving the hut and embarking on my first ascent of the Pico de Aneto. This early start is necessary to avoid melting snow and thunderstorms later on the return journey. From the hut, you take a fairly obvious path leading in a southerly direction. The path is marked by red dots painted on boulders and small cairns. It is not yet dawn and so I need to use a head torch for the first half hour. My excitement at this exploration into the unknown builds, and my pace quickens. I try to manage my pace, so not to tire too soon. I have about eight to nine hours ahead of me. The first forty minutes is a traversal of rocks and boulders until I eventually reach the foot of the Glacier de la Maladeta (2,620 m, UTM E30712 N472563). Here, I stop and put on my crampons, but I feel secure enough with using the walking poles and leave the ice axe in my backpack. I march out into the glacier using the walking poles to steady myself. At this point I feel the ascent has started in earnest. I begin to feel like an explorer of olden times and a real mountaineer. There is something exhilarating about embarking on a adventure into the unknown on your own without the security of others for safety. Travelling south towards the Portillon Superior, the glacier gets steeper and it becomes necessary to zigzag a switchback course up the mountain to mitigate the steepness. I’m still on the first glacier, the Glacier de la Maladeta, but despite its steepness, I don’t feel that I need to have quick access to the ice axe. A few times, I consider removing my backpack to fetch the ice axe, but the ground felt a bit too steep to be making any awkward manoeuvres, and I was afraid that if I dropped something, it would roll down the slope and be lost forever. The route up is fairy straightforward – just continue south until you approach a rocky section at the ridge of the Pico de Maladeta (2844 m, N42.65475 E0.64415), which leads into the Portillon Superior. This is the crossover point to the second glacier, the Glacier de Aneto. It is amazing how many climbers miss this point and instead continue on into terrain that becomes much more precarious. At the rock section leading into the Portillon Superior, I remove my crampons, climb and then drop back down through the Portillon Superior, to the Glacier de Aneto (2860 m, UTM E30712 N472563). I am now on the second glacier, the Glacier de Aneto. This glacier, just north of the Aneto summit, is largest block of ice in the Pyrenees, but unfortunately is shrinking rapidly due to warming summer temperatures. In the last 100 years, it has lost more than half of its surface, and in another 40 years it may disappear completely. At this point it is necessary to put my crampons back on. From here, the Summit of the Pico de Aneto is visible far away in the distance and the glacier rises steeply. Some rocky sections interrupt these snow-white fields, but to save time I keep my crampons on. I continue walking holding the ice axe in my uphill hand and the walking pole in my downhill hand. At this altitude, the air is noticeably thinner, causing my heart to beat faster and my breathing to become quickly. I also find my energy levels feeling a bit depleted, everything just feels that little bit harder. I am beginning to feel a bit nervous about the steepness of the glacier at this point. I started noticing these strange whirling snow patterns running down the slope and over a ledge far below. At first these sights puzzled me, but then I discovered that as the walking poles displaced small fragments of snow, the snow ran down the slope, amassing more snow into a snowball. It was quite fascinating to watch, but also quite sobering to realize how even a small object can pick up speed so quickly. Eventually, the gradient of the glacier eases off as I come on to the Collado de Coronas (3284 m, N42.63330 E0.65516). I am glad that I have reached this point and now I can chill out some. I am still a bit concerned of the return trip – they say most accidents happen when you’re coming down. After about five hours of climbing, I now reach the last obstacle, where the snow ends and the Paso de Mahoma (3361 m, N42.63185 E0.65639) begins. The Paso de Mahoma is a narrow crest with very exposed drops at either side, but is an easy scramble. The name translates into English as the “Bridge of Mohammed”, because according to a Muslim legend the entrance to Paradise is as narrow as the blade of a scimitar on which only the righteous pass. I guess I can call myself one of the righteous if I make it across this scimitar. Many people fail to cross the Paso de Mahoma because they fear this exposure. Even though it was very cold at the top, I decided to remove my gloves, because as a rock climber, I know that you can get a much better grip with bare hands. My other trick was not to look down, but instead imagine that this crest was only a meter or two above the ground. This worked and I crossed the crest with very little difficulty or fear. Eventually, I reach the Summit. 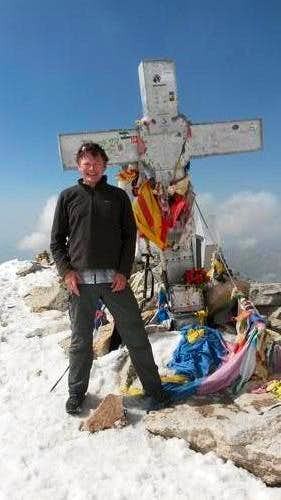 The summit of the Aneto is marked with a large white cross, with flags and other textiles attached, reminiscent of the prayer flags that one might see in the Himalayas. The first person to reach the summit was a man by the name of Platon de Tchihatcheff, a former Russian officer, on the 20 July 1842. It is now 10:35 am on the 21st of December 2014, five hours after I left the hut, and I am standing on the roof of the Pyrenees, just 172 years after it was climbed for the first time. The views and panorama are spectacular. I wander around the top for about 15 minutes, as other climbers start to arrive, and then I make my descent. I had expected the descent to be more difficult, but it is actually easier than the climb and I descend back to the hut in about three hours. The entire return trip has taken about eight hours. As I’m not staying in the hut this night so I descend for another forty minutes to the car park. I have no place to stay tonight, so I drive for about half an hour until I get a mobile signal again, and then I search for nearby accommodation. I had hoped to stay in Benasque that night and celebrate my achievement, but everywhere was fully booked. All that was available was a hotel in the tiny village of Sahun. I reasoned that as it is probably in the middle of nowhere, I would get good nights sleep. When I arrived at my hotel, it was facing the village square, which was also quite small, but with a large bandstand being erected. This didn’t bode to well for the anticipated peaceful nights sleep. I went to my room, freshened up and wrote up my journal. At 10:00 pm, the band started up and it became clear that I was not going to get any sleep that night. So rather than trying to force myself to sleep, I got up and joined inwith the activities outside. 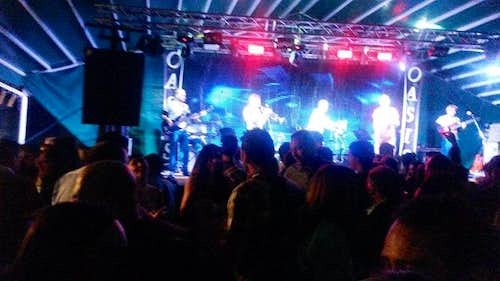 It was actually a summer solstice fiesta – the first Spanish fiesta that I’ve experience. The band, composed of seven members playing guitars and saxophone, played a broad array of music ranging from the Glen Miller band to Lady gaga. This party atmosphere was very unexpected and it was so entertaining that I forgot how tired I was from climbing the mountain. The fiesta eventually finished at 5:30 in the morning. I had awoken yesterday at 4:45 AM, climbed a mountain, partied until 5:30 am this morning, and then I thought to myself “What a way to celebrate the Summer Solstice”.